Not many places are as walkable as New York City. It has the lowest car ownership rate in the nation, with 56% of households foregoing a vehicle. This naturally means that people do a lot more travel by sidewalk. But when sidewalks are in disrepair, it can lead to serious injury or even death. Those injured in a fall on a poorly-maintained NYC sidewalk may experience many types of injury – physical, psychological, and financial. In the most serious cases, sidewalk falls can even be fatal, placing enormous emotional and monetary strain on loved ones left behind. The personal injury lawyers at Friedman, Levy, Goldfarb & Green fight for the rights of those who have been injured because of someone else’s negligence, tirelessly pursuing full compensation for those who suffer sidewalk injuries. Who can I sue for a sidewalk fall injury? Who is responsible for a NY sidewalk? Local laws determine who is responsible for a sidewalk, and this plays a large part in figuring out who is to blame for a sidewalk fall. In many cases, the owner of the property abutting a sidewalk is responsible for its maintenance and repair. Other potentially liable parties can include landlords, property managers, and those hired to maintain the area. New York City Administrative Code alters this general rule in Manhattan, Brooklyn, and all across NYC, and in many cases makes it more difficult to bring a lawsuit. Under local law, the City of New York is responsible for sidewalks abutting 1-, 2-, and 3-residence homes. 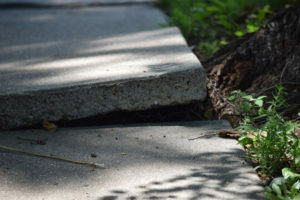 However, it prevents those injured in sidewalk falls from filing a sidewalk negligence lawsuit unless they can show that the City had prior written notice of the defective condition of the sidewalk. Who’s to blame if you slip and fall on a sidewalk? Potential parties you can sue in New York after a sidewalk slip and fall include property owners or managers, landlords, maintenance crews, or the City of New York. Liability will depend on the particular circumstances of your injury, so it is wise to speak with a New York personal injury lawyer before filing a lawsuit. In New York, a plaintiff needs to be able to prove that a defendant was at fault for a personal injury in order to prove legal responsibility. In sidewalk fall cases, this usually means presenting evidence to show that the defendant knew or should have known of a dangerous condition of the sidewalk and that the condition was a substantial factor in the fall. Also, expect the defendant to point the finger back at the plaintiff as the potentially at-fault party. If the defendant can show that plaintiff, partly or wholly, contributed to the fall — such as by not watching where they were going — they may reduce or eliminate any monetary award to the plaintiff. It is important to be able to pinpoint the cause of the fall and to preserve any evidence of it in order to support an injury claim. Take photos of the area and obtain the contact information of any witnesses to the fall. Sidewalk falls can lead to injuries such as head trauma, broken bones, strains, bruises, cuts, and in some cases even death. The slip and fall attorneys at Friedman, Levy, Goldfarb & Green work with medical professionals and other experts to explain to judges and juries why the fall occurred and how it led to the injury and any lasting effects. Our team of expert witnesses help juries understand what fair compensation is for the losses sustained because of the fall. Laws, called statutes of limitations, limit how long injured parties have to file a claim for a personal injury such as a trip and fall on the sidewalk. If you have sustained an injury on a New York sidewalk, speak with an NYC slip and fall injury lawyer at Friedman, Levy, Goldfarb & Green as soon as possible. For decades our committed advocates have given unmatched personal attention to our clients while fighting for maximum compensation. We focus solely on personal injury cases and are available 24/7 to speak. Call today for a free confidential consultation with one of our distinguished New York sidewalk fall lawyers.